Under an Air Force Office of Scientific Research, multi-university grant, a team led by University of New Mexico professor, Dr. Mansoor Sheik-Bahae created the first-ever all-solid-state cryocooler that can be applied to airborne and spaceborne sensors. This technology, which allows coolers to reach temperatures so cold that they can only be obtained by liquefying gases, may lead to advances in superconducting electronics because it would enable miniaturization for cooling purposes. Graduate students Denis Seletskiy and Seth Melgaard designed and performed the experiments at UNM's department of Physics and Astronomy in collaboration with researchers from Los Alamos National Laboratory and the University of Pisa, Italy. "Optical refrigeration or solid state optical refrigeration technology offers many advantages over currently used, bulky mechanical coolers because it is vibration free (no moving parts), compact, lightweight and agile (fast turn-on and off)," said Sheik-Bahae. Previously, only solid-state coolers based on standard thermoelectric devices were able to reach temperatures as low as 170K, and even so, only with minimal efficiency. "We obtained cooling down to 155K using optical refrigeration,"said Sheik-Bahae. "We expect that material research may lead to temperatures dipping below 77K (boiling point of liquid nitrogen) and in the future as low as 10K may be possible," he added. In order to achieve their results, the scientists enhanced cooling efficiency by exploiting resonances in the absorption spectrum, growing pure crystals, using thin optical fibers, keeping their sample in thermal isolation inside a vacuum and by trapping laser light in a resonant space. In the future Dr. Sheik-Bahae and his team will continue collaborations with Professor Mauro Tonelli and his researchers at the University of Pisa in Italy as well as with Dr.
Richard Epstein of the Los Alamos National Lab. Together they plan to research product purity and new materials for cryocoolers. 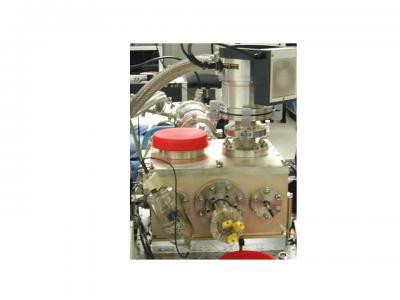 "We are also pursuing optical pump sources that can further enhance cooling efficiency of the devices," he said.